Ohio State University Extension has enjoyed significant accomplishments and created lasting impact for individuals and communities throughout Ohio during the last 100 years. We looked to the future to discover how we can continue to improve the lives of Ohioans in the next 100 years. The Vice President’s Conversation on the Future of Extension is a strategic foresight project that intentionally asked questions about envisioning a long-term future of OSU Extension including the role the organization should play in shaping and positively impacting Ohio and Ohio’s residents. The goal of the conversation was to engage broad participation across the state to identity the most important emerging issues and potential challenges likely to confront all Ohioans by the year 2035 and how OSU Extension might best meet those challenges in the years ahead. The first part of the guiding question focused on the futuring part of the inquiry that occurred from March through April 2015. The second part of the topic question focused on visioning, or more importantly, discovering opportunities, which took place from April 2015 through June 2015. 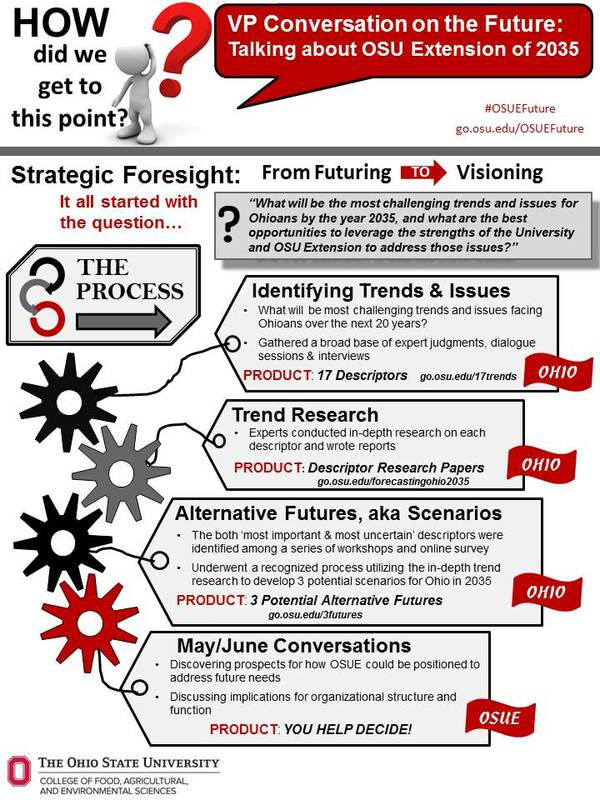 We took all the information gained from forecasting Ohio 2035 to ask OSUE stakeholders, “SO WHAT? Now that we have glimpsed into the potential alternative futures, what could or should OSU Extension do?” Visit the link below for more details.